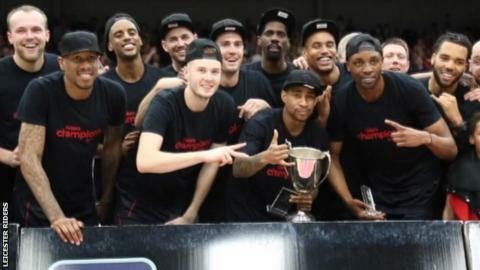 Clinching the BBL Championship in front of a capacity crowd at their new home in the final game of the season ranks as one of Leicester Riders's greatest successes, says coach Rob Paternostro. The Riders beat Newcastle Eagles 84-73 in front of a sell-out crowd of 2,400 at their recently opened £4.8m Leicester Arena home on Friday. Asked if it was Leicester's best triumph, Paternostro said: "I think so. "With the new arena here and the way we won it at the end here it feels great." Talking to BBC Radio Leicester, Paternostro continued: "When we moved into this arena, you couldn't have written a better script than that. This is special." It is the second time in four seasons that the Riders have topped the British Basketball League standings at the end of the regular season. They go into the play-offs as top seeds and face Leeds Force in their two-leg quarter-final this weekend. Paternostro said Leicester, who have collected the BBL Trophy after losing the BBL Cup final earlier this season, will be focused on post-season success. "We will enjoy this one, then when the play-offs start we will be ready to roll," he said.